Insights to Behavior provides built-in data capture and reporting tools allowing teams to generate individual student progress reports and graph the frequency of challenging behaviors over time. 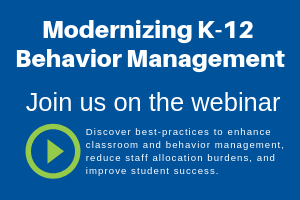 Modernize behavior management processes: Track and monitor both student and teacher progress. View centralized reporting and an at-a-glance dashboard. Benefit from access to real-time insight that enables school officials to proactively react to violent changes in a student’s behavior and mitigate high-profile incidents. Save time with report generation tools during quarterly reporting periods. Share reports with the entire teaching team, parents, and administrators. Effortlessly add to your students’ IEP.